Heh.. This month has been quite lacking as far as entries go. I suppose I shall make one more entry before May 2005 concludes and June 2005 arrives. May has been pretty busy, though I don't recall why. School keeps me busy. 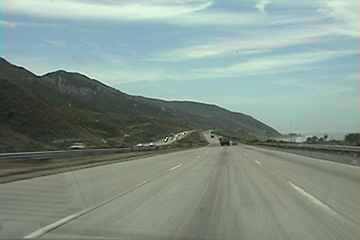 Driving between Santa Barbara and Camarillo and Camarillo and Santa Barbara keeps me busy. Sleeping keeps me busy. Friends keep me busy. Stuff.. generally keeps me busy, though this does not mean that I'm not bored out of my mind.. oh no.. you see.. I am constantly bored out of my mind in a very intense agonising way... But that's another story for another time when I'm in more of a ranting or depressed mood for right now I am generally in high spirits. It seems that I was generally rather busy in May, but what all the things were which kept me busy I seem to have some difficulty recalling. I attest this lack of recollections to the fact that my mind is not filled with any memories for there really were no memories to be stored in my mind... But.. Whatever. Back in March, in the profoundly titled entry "A car, A train, A helicopter" I had posted a pilot episode for The Mobile Perspective. At the time, it was more of a way to kill some time and to experiment. Now, I want to take it further. With this entry I release the first episode of The Mobile Perspective: 1x01 - Santa Barbara to Camarillo. Just about 40 MB's for just about 10 minutes. Please let me know what you think! 00:09:54, 360x240 @ 512 kbps/44kHz @ 96 kbps, 43.0 MB XviD file. Last Sunday was my first day and first time in the studio at Brooks. I met up with two classmates, Josh and Matt at the studio to shoot an assignment. On Monday again at the same time as the night before (18.00) we met at the studio to shoot another assignment. So far I really like the studio. It's awesome. 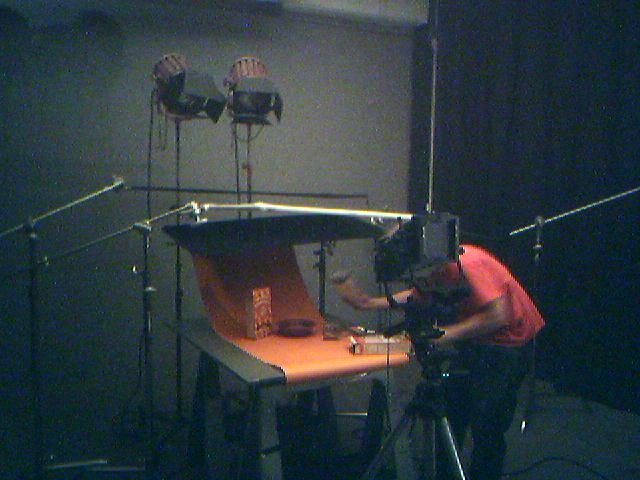 Taking photographs with a 4x5 camera in a studio with a lot of lights... A lot of fun. Set shot taken on my phone's crappy camera on Monday at around 21.00. Another Brooks student, Matt is hidden behind the 4x5 camera. Last Tuesday.. or.. Wednesday.. I don't remember.. My dad left for a two week business trip in Bangalore, India. I had a four day weekend this week because I didn't have school today because of whatever holiday it is. I have class next Saturday, instead. Argh. Hrm.. Yep. I just remembered why there are so few entries this month: There's nothing, absolutely nothing to write about. It's the same boring things day in and day out. How boring. Heh.. Oh well. I suppose it's my fault that I'm bored with life, currently. One can tell that summer has arrived. The sun doesn't set until past 20.00. There's fog in the morning, smog during the day, and returning fog in the evening. My room is no longer freezing as it is throughout winter. Instead it is uncomfortably warm. One can walk around outside past midnight with nothing but a shirt on and not be cold. Oh.. and.. Its hot during the day! Argh. Anyway, I really only made this entry so that I could post the first episode of The Mobile Perspective and get one more entry in before the end of May. haha, i love the ending in camarillo where i actually recognize stuff. you should pass more cars or something, maybe blast a few away. make it more interesting. lasers always make things interesting. and yea, it's getting hot here and the sun is up forever -- but there's no fog here coastal boy! Ahhh we have to finish the movie! WTH Marco! nah its my fault to, i havent had the time either. But we have to finish it sometime!